Assembling the pen bit by bit and getting it ready to write. 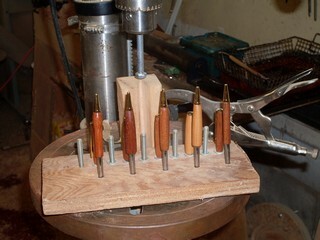 One by one I move from left to right pushing the nib and then the finial holding the clip into the blanks. A simple pull of the lever and I am done. 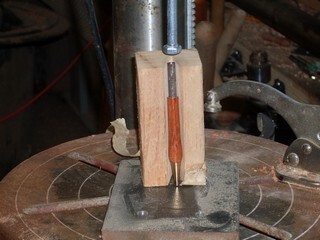 When I do the clip and finial I align the clip for best effect and press the finial to keep it set. There is an obvious feel of solidity when the pieces fit into place. 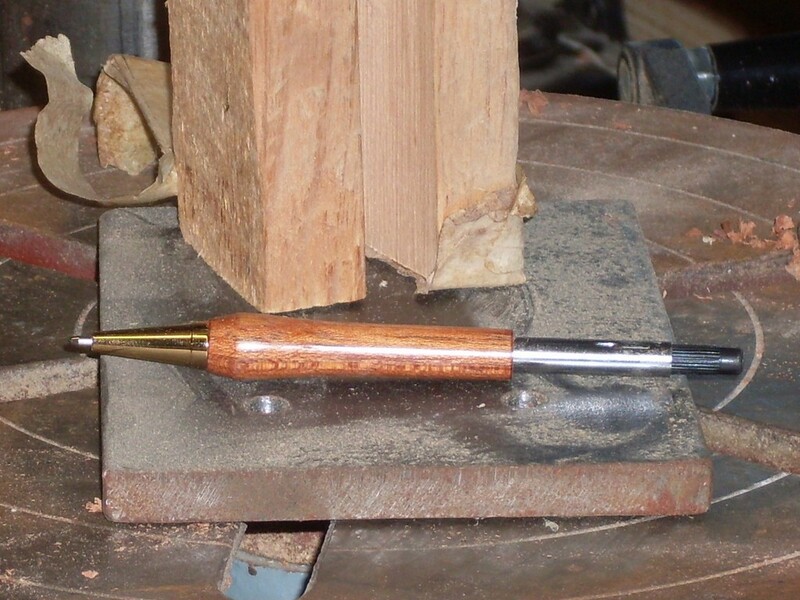 If the twist mechanism is in the pen too far or not far enough, the whole pen feels funny. For some weird reason this happens even if you have put a flair on then end of the pen or made a resting place for the grip. It just does. on the other hand the refills are an industry standard and the length for all intents and purposes is fixed. Kit makers have put an incised line on the mechanism so that, assuming your blanks are exactly right, a mechanism set to the line will work properly with the refill. 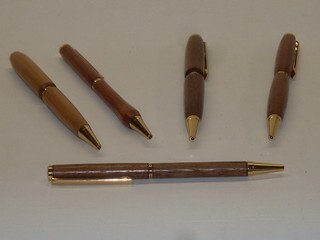 Since people like to make other styles with the slimline kit and this approach will not work with other designs using the 7mm tubes such as a Mont Blanc™, and taking the approach that it is easier to push the mechanism in a bit farther than it is to disassemble the pen, I took a piece of wood, squared the ends and cut a notch in the side to hold the pen in place. I then tried the mechanism with a refill. It was not in far enough so I shaved off a hair. Still too long so I shaved off a hair. Repeated until perfect. 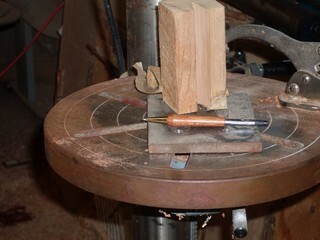 Now this block sits on a piece of scrap wood or metal on the drill press as I mount one mechanism after another. As each pen is assembled with its mechanism it no longer fits on the bolt so it sits now in front of its respective top blank. 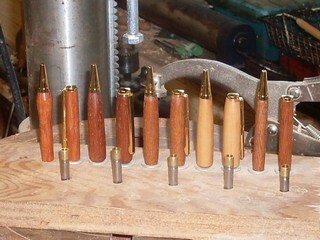 Finally the center bands are placed on the mechanisms and the pens are assembled. These five pens are all made from the slimlind kit. 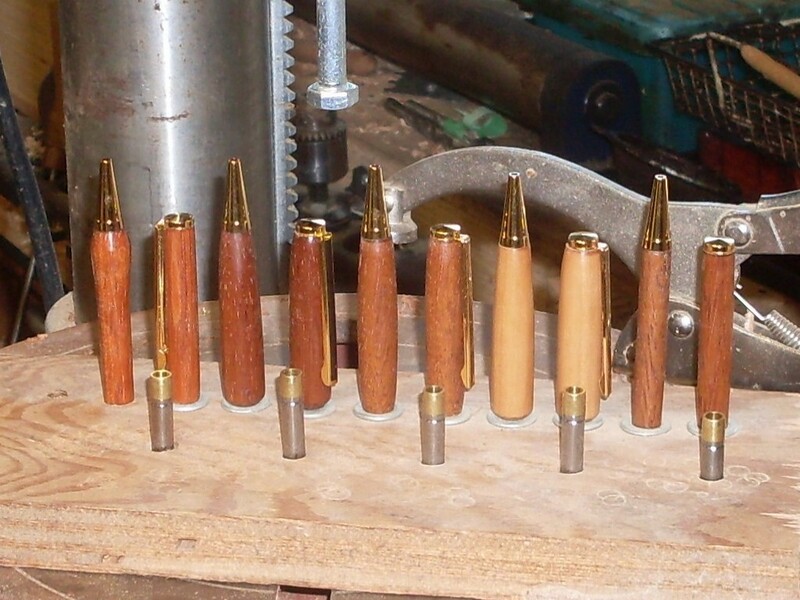 Only the woods and the design of the blanks vary.